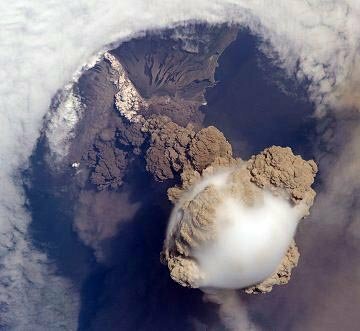 VOLCANIC PLUME: An enormous plume of sulfur dioxide (SO2) blasted into the stratosphere by Russia's Sarychev Peak volcano on June 12th is circumnavigating the globe at northern latitudes. Check out this movie made by the GOME-2 sensor onboard Europe's MetOp-A satellite. SO2 is drifting across the North Atlantic and appears poised to reach Europe over the next 48 hours. Sky watchers there should be alert for volcanic sunsets. 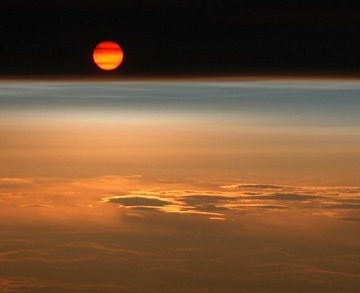 VOLCANIC SUNSET: On June 22nd, photographer Brian Whittaker was flying 35,000 feet above Nunavut, Canada, when he witnessed "the most spectacular sunset that I have ever seen," he says. "The giant volcanic cloud from Russia's Sarychev Peak [see below] was illuminated by the arctic sun--and this completely transformed the landscape. For a moment, I thought I was on Mars." "All the curtains were drawn so that people could sleep which is very normal," notes Whittaker. "It is possible that very few people have seen this despite all the potential observers!" Whittaker's airplane traveled all the way from British Columbia to Europe, so he got a good long look at the cloud. "It stretched for more than 4,000 kilometers. Will it reach Europe?" he wonders. Stay tuned for updates. (1) The volcano erupted with such force, the plume actually punched through the atmosphere. Note how clouds around the volcano have parted in a circular ring--that is a result of a shock wave produced by the upward blast. (2) The plume is a mixture of brown ash and white steam. A "dirty thunderstorm" complete with lightning could be in progress within the roiling cloud. (3) The smooth white bubble on top of the plume is probably a mass of water condensing from air shoved upward by the rising ash column. If so, it is akin to the iridescent pileus clouds sometimes featured on spaceweather.com. If you're not amazed yet, try this: Put on a pair of red-blue stereo glasses and behold the eruption in 3D. The anaglyph was created by graphic artist Patrick Vantuyne of Belgium. No stereo glasses? A cross-eyed version is also available. On June 26, 2009 there were 1065 potentially hazardous asteroids.